The Gorkiy Automobile Factory was established in 1932 as a joint venture between Ford Motor Company and the Soviet Union. Established in Nizhny Novgorod, GAZ (Gorkovskiy Avtomobilnij Zavod) produced a number of Ford designs before modifying those designs to meet Soviet Army requirements. The GAZ-AA was based upon the Ford Model A light truck and by adding an additional axle and heavier suspension, this rendered the GAZ-AAA 2+ ton truck. This GAZ-AAA was a 4x6 that entered production in the mid-1930s and continued through the early 1940s. This vehicle, like many others, were pressed into wartime service with the Soviet Army in the Great Patriotic War (World War II) and captured examples were likewise put to work in the Wehrmacht. 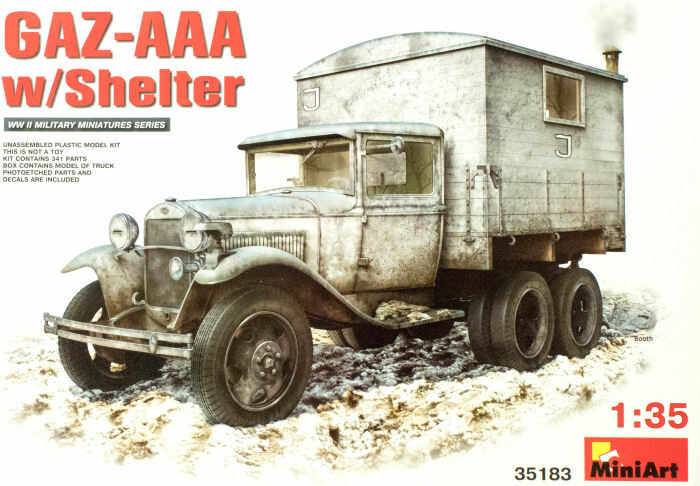 MiniArt is back with this interesting variant of the GAZ-AAA which is depicted with a box-body shelter mounted behind the cab. Molded in light gray styrene, the kit is presented on 12 parts trees plus two trees of clear parts and one small fret of photo-etched parts. The kit consists of numerous tiny parts (like the U-bolts which hold the frame rails together) so this kit is definitely recommended for experienced modelers. The level of detail in this kit is similar to the Tamiya 1/12 Forumla One race cars, and perhaps even more detailed. From the engine and transmission to the drivetrain and suspension, all of the details are here. About all you're missing is the wiring harness and that can be easily fabricated by the AMS modeler. Construction starts with the chassis and it is highly recommended that you take the extra time to square and align the frame so the model will sit properly after assembly. If you have a jig for this job, so much the better. The same care will be needed for the twin-axle assembly to again ensure that the model is square. Each of the tires build up from seven disks, three on one half and four on the other. These go around 12 wheel hubs to create the ten wheels and two spares used by this truck. These separate tires and wheels will make painting much easier. Here is another work of art from MiniArt Models. This kit will build up into a very detailed model of this old Gazified Ford Truck. As a standalone model, this will be a nice contender on the contest table, but with the addition of figures and a nice display base, this model can be the basis of a great diorama or vignette.